This week was all about getting started in earnest on the FlickFleet fulfilment. 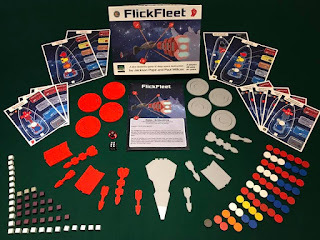 Unlike most Kickstarted games, FlickFleet is hand-crafted so rather than sending the artwork off to printers in China and then waiting months for stock to appear we’ve ordered all the bits for delivery to our houses and we’re going to be busy hand-crafting them for the next several months. The downside of this approach is that we have less time available for designing and playtesting new games and less free time in general, the upside is that we can start shipping games way earlier and do a much smaller print run which has less risk. This week I’ve collected the greyboard from the printers and made 30 blank boxes. The printer found things took longer than they expected so I don’t have the artwork yet (I’m getting most of it on Tuesday), but I’ve already made 30/52 of the boxes I need by the end of March. A stack of 10 boxes - 90 minutes' work! The wooden pieces also arrived (to my house, not Paul’s :-( ) and Paul got the laser cutter installed, set up and received training on its use (he took 15 pages of notes!). He’s already got it working and has worked out the best settings for the standard copies and is now trying to find optimal settings for the deluxe ship etching. Once we’ve done a test of the etching on the final sheets we can order those (145 each of red and grey - 150kg / 1.3m3!). But I want to make sure everything works fine before we spend £2,000 on acrylic! This week I’ll start wrapping those 30 boxes with their labels. Paul and I are meeting up for a weekend away in about four weeks, so when we do we’re going to swap boxes and bits so we can both start posting games on our return. At this point everything is still on track! Yay! Over the last couple of weeks I’ve spent my lunch breaks at work finalising things, double checking them and placing orders. Until now the only things to arrive have been the dice and some test acrylic for commissioning the laser cutter. This week things move up a gear as the greyboard for the boxes arrives (collecting tonight), the artwork arrives (I’ll be collecting it on Thursday I hope), the laser cutter arrives (installation, commissioning and training Paul on Friday) and hopefully the baggies and all the wooden bits will arrive too. Paul’s family and mine have a long weekend away booked at the end of February, so we’re intending to swap finished boxes (packed with rules and ship dashboards) and baggied bits and ships, that way we can both start shipping games on our respective returns home. We have 50 packages to ship by the end of March, and the first one won’t leave until the end of February, so it’ll be tight, but hopefully we’ll get it done. Now, time to start crafting some boxes! A week ago we had the Kickstarter funds in our account and we were ready to start paying for things. Half of it is now gone! We’ve ordered the dice and they’ve arrived; a proof of the artwork and that’s arrived, been assembled and proof-read - the rest of the printing will be ordered today. We’ve ordered the wooden pieces and baggies (delivery in a couple of weeks) and the laser cutter (about a week away). Things are fast underway! To meet our Kickstarter commitments we need to craft 270 FlickFleets and 27 Zombologies by the end of December. I have a crazy plan in my head where we try to get them all shipped by the end of August instead - which simplifies the bookkeeping somewhat as that’s the end of our financial year. However that plan involves making 10 copies every week between now and the end of August. We can have 5 weeks off for work travel and holidays, but that's still quite a stretch! I was hoping that it would take me about 20 minutes to do my part (making boxes and cutting out ship dashboards), but the first attempt took 32! That’s nearly six hours of crafting a week. That doesn’t sound like a lot until you realise the time I have available for crafting is usually 9-10pm - so that’s 6 out of 7 nights every week! I’m hoping I can speed that up a bit - the boxes were made out of too thick board (the printers had run out of the right thickness) which took longer to cut and I’d run out of tape so for the proof (my copy!) so I just did the corners without tape - using the box labels to hold them together - which was a bit of a faff and definitely took longer. I’m also hoping there will be time benefits from doing a few copies at a time - less task switching should be more efficient. At the moment things are all still up in the air though - it’ll be good once construction has begun in earnest and these things are all a bit better understood! This week we are placing the orders for the wooden bits, the dice, the baggies, a proof of the printing and the laser cutter. FlickFleet is off to the races! We've got to make 273 of these in the next 12 months! 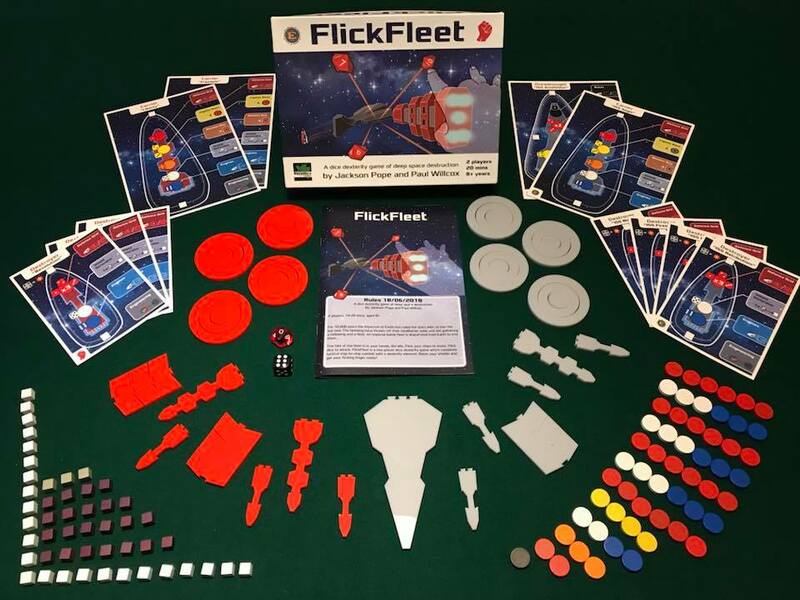 We hit our deadline for the last pledge level (the Print and Play files by the end of December), now we need to make 50 deluxe copies of FlickFleet, 2 standard copies of FlickFleet and 3 copies of Zombology by the end of March. I’m hoping we can do more than that, as I’d like to get ahead of things and ideally deliver all the rewards before the deadlines (the December one is currently the most work, so the more we can do to get ahead of things early the better). I’ve finished off the box art and I’m now re-jigging the laser cutting files again to fit everything on the laser bed (which is slightly smaller than I was expecting). I’ll get a proof of printing before the end of the week and then, assuming that’s all ok, I can go ahead and order the rest of the printing. In the meantime I finished two of the three Zombology copies we need by March last night and will be doing the third tonight. Then I'll build a few for stock in case of website orders or another stocking order from our retailer (singular!). The next few months are going to be pretty busy!